German Martin Bach Sr. emigrated to America in 1891, where he was hired by Louis C. Tiffany. Little did Tiffany know, he had just hired his future competitor as his first batch-mixer. Quezal was founded by Martin Bach, Sr., Thomas Johnson, Nicholas Bach, Lena Scholtz, and Adolph Demuth. The factory was located on the corner of Fresh Pond Road and Metropolitan Avenue in Maspeth, Queens, New York. By 1904, fifty glassworkers were employed at Quezal. Works by the producer can be recognised by their Art Nouveau style, inspired by organic forms and natural motifs such as flowers and leaves. The blossoming designs in stunning iridescent colors rank the glassworks up there along with pieces by Louis Comfort Tiffany and Frederick Carder. And the enigmatic name? 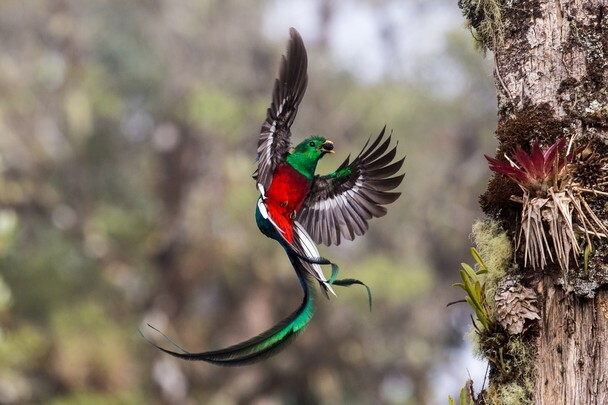 It is inspired by one of the world’s most elegant birds, the rare quetzal, which flutters in the treetops of the secluded tropical forests of Central America. Quezal glass is adored for its shimmering, iridescent surfaces on the interior and exterior of the glass. The rainbow colors and metallic hues of gold, purple, blue, green, and pink were clearly inspired by the enigmatic quetzal's plummage. In recent years, glass collectors have rediscovered Quezal art glass, and collector desirability for the glassware has increased dramatically. In the past five years, rare and important pieces of Quezal glass have been known to sell in excess of $36 000. Check out realized prices for Quezal here. Exceptional pieces of Quezal are on display in collection across the States, including at the Metropolitan Museum of Art and Brooklyn Museum of Art. On April 9, Woody Auction has a superb collection of Quezal glass, a selection of which is pictured above. The pieces come from the esteemed collector of American decorative arts, Sue Frick. Search the full catalog on Barnebys here.